When she was 14-years old, Margarita was addicted to drugs and in and out of the juvenile justice system. During one stay, she discovered she was pregnant. Officers transferred her to a maternity home in Georgetown, Texas. A director at the maternity home shared information about Nurse-Family Partnership with Margarita. The idea that a nurse would stay with her throughout her pregnancy and the first two years of her baby’s life meant a lot to Margarita, and she joined the program. “I didn’t know much about babies or pregnancies and didn’t have a good support system. I thought a nurse could teach me what I’m supposed to do,” says Margarita. She was soon introduced to her nurse, Desiree, a Nurse-Family Partnership nurse at Any Baby Can. Margarita returned to high school and picks her baby up from daycare each day when school ends. She and her baby’s father play in the park with their baby, and Margarita looks forward to continuing her education after high school. She’s considering careers in nursing, juvenile counseling and corrections. Desiree has seen Margarita’s love for her baby flourish, and feels honored to support Margarita through this part of her life. “I am incredibly proud of Margarita’s personal growth,” says Desiree. “It’s been inspiring to see Margarita blossom as a mother and as a woman. Throughout our time together, I have encouraged Margarita to be the author of her life and it’s uplifting that Margarita wants to share her story and give hope to other teen moms. Margarita shared with me ‘If I can do it, they can too!’,” says Desiree. 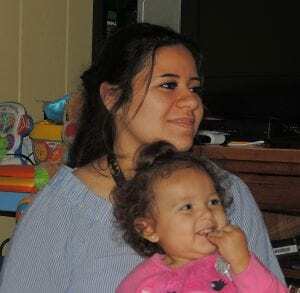 NFP nurse Desiree, Margarita and her daughter. “I enjoy walking alongside my clients and helping them learn to advocate for themselves and their babies,” shares Desiree. “Margarita has turned her life around, achieved a lot of personal goals in a short amount of time, and has so much potential success still ahead of her,” Desiree concludes. As she continues the second year of the program, Margarita feels better about the next part of her life. She describes herself as more confident and supported, and encourages other first-time moms to call Nurse-Family Partnership if they are in a hard spot, frustrated or need help. Contact us to learn more, or so we can get you connected with your personal nurse. * Disclaimer for 28 weeks or less pregnant: Some exceptions may apply please check with your local Nurse-Family Partnership agency for more information. I understand that filling out this form and submitting my contact information does not guarantee my place in the program and is consent to have my information forwarded to Nurse-Family Partnership to see if I can receive a personal nurse.